Look for our RED exterior magazine display bins at area shopping centers and in downtown Shreveport & Bossier City. Look for our plastic interior magazine displays at apartment leasing offices. Look for our interior magazine displays at area businesses. Apartment rentals in Shreveport. Apartment rentals in Bossier City, LA, The Shreveport-Bossier Apartment Shoppers Guide can be found almost anywhere you look! 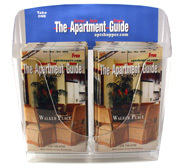 Pick up The Apartment Shoppers Guide at grocery stores, gas/food stores, hotels and Barksdale Air Force Base. Additionally the Chamber of Commerce provides The Shreveport-Bossier Apartment Shoppers Guide to newcomers. Find this apartment guide at apartment communities leasing offices and many other locations. 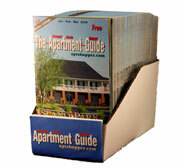 Barksdale military apartments are listed in the Shreveport-Bossier City Apartment Shoppers Guide. Now featuring Ruston, Louisiana LTU (TECH) and LSU-S student housing! Look for our RED exterior magazine display bins at shopping centers, downtown Shreveport, and Bossier City areas. Now distributed in Ruston, LA. 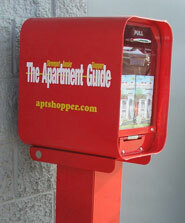 Now the printed version of the Apartment Shoppers Guide is featured on www.aptshopper.com. Click on each individual apartment name and watch a full pg ad enlarge! Print the page out and you are on your way to finding your next apartment rental home in Shreveport, Bossier City, Ruston, and West Monroe, LA. Click on each individual apartment name and watch a full pg ad enlarge! Print the page out and you are on your way to finding your next apartment rental home in Shreveport, Bossier City, Ruston, and West Monroe, LA.